Though less common in Indian population, basal cell carcinoma (BCC) is one of the commonest malignant tumors of the skin worldwide. Diagnosis of BCC is usually made clinically, which can then be confirmed microscopically. Suspected lesions especially on high-risk areas of face should undergo prompt biopsy to get timely histopathological confirmation of the diagnosis. Histopathological examination is considered the gold standard for diagnosis of BCC, which needs excisional, incisional or punch biopsy to get tissue sample. On the other hand Tzanck test is simple, easy to perform, inexpensive and a rapid test for cytological study to confirm or exclude malignancy. Quick staining and rapid interpretation are the added advantages. Only few studies have investigated the value of Tzanck test in the diagnosis of BCC. We compared the diagnostic accuracy and reliability of Tzanck test with histopathology in the diagnosis of BCC in order to assess the clinical applicability and value of the Tzanck test. The patients studied were clinically suspected cases of BCC who attended our OPD between November 2011 and October 2013. Twenty six consecutive patients with clinical diagnosis of BCC were included. The aim of the study was explained to the patients and informed consent was obtained. Detailed history, including family and occupational history was taken and a full skin examination was performed. The diagnosis was clinical, based on typical features of BCC. Samples for both histopathological and cytological examination were obtained from each patient. The accuracy of Tzanck test for diagnosis of BCC was then analyzed by comparing its results with those of histopathology. Histopathology specimens were obtained with a 4-mm punch biopsy or whole tumor was excised in case of small tumor, under lidocaine 2% local anesthesia. The samples were fixed in 10% formaldehyde and sent for histopathological examination. To get sample for Tzanck smear from crusted ulcers, crusts were removed after soaking the ulcer with normal saline gauze for 10 minutes. For non-ulcerated tumors, a small incision was made with a sharp pointed scalpel blade. Care was taken to avoid undue bleeding. Samples were obtained by scraping with a blunt scalpel. The tissue obtained was smeared on to the slide or pressed between two slides. Local anesthesia was not required in any of the patients. Air-dried specimens were stained with Giemsa stain. The commercially available Giemsa stain solution was diluted 1:10 with distilled water, and poured over the smear and kept for 15 minutes. Then it was washed gently under running water and examined under the microscope. We followed the criteria  for the cytological diagnosis of BCC which includes (1) high intercellular cohesion in tissue fragments, (2) High nuclear-cytoplasm ratio of tumor cells with the cytoplasm forming a very narrow basophilic rim around the nucleus, (3) Small size of the tumor cells, (4) Morphologically uniform tumor cells, (5) Oval or fusiform and sometimes round nucleoli with blurred chromatin structures, (6) Presence of pink amorphous material in some lesions, (7) Nucleoli usually not evident and (8) Some fragments with distinct sharp borders. Specificity, sensitivity, positive predictive value and negative predictive value of Tzanck smear were calculated by their mathematical formulae. We recruited 26 clinically suspected cases of BCC. Histopathology confirmed BCC in 23 patients [Table 2]. Histopathological diagnosis of BCC was made on the basis of predominant basal cell type, peripheral palisading, clefting between the epithelium and the stroma in addition to variable degree of cellular atypia and mitotic figures [Figure 1]. Tzanck test correlated well with histopathology in 12 cases Tzanck smear of all 12 cases fulfilled the diagnostic criteria and showed presence of characteristic basaloid cells with palisading arrangement [Figure 2]. In 11 histopathologically diagnosed BCC, cytology was considered either negative or inconclusive. All three histopathologically excluded cases were also excluded by Tzanck smear. Taking histopathology as the gold standard, the sensitivity and specificity of Tzanck test were calculated as 52.2% and 100%, respectively. Positive predictive value was 100% and negative predictive value was 21.42%. Positivity of Tzanck test was more with ulcerated lesions (2:1). Nodular subtypes correlated best with positive Tzanck test as shown in [Table 3]. Compared to non-ulcerated lesions chances of getting a true positive cytology is double with ulcerated lesions. The usefulness of cytological examination in primary cutaneous malignant tumors is well documented. Both FNAC and Tzanck test have been used for cytological diagnosis of BCC, but comparison between FNAC and Tzanck test have not been undertaken. FNAC is a simple procedure, which may provide an accurate diagnosis to confirm or exclude malignancy. Oram et al. suggested that this easy to perform technique can be considered reliable in the differentiation of BCC and SCC. In a study conducted by Menije et al., FNAC showed both a high sensitivity and specificity in the diagnosis of malignant skin tumors, specifically BCC. Kassi et al. found this technique appropriate for the initial evaluation of suspected cases of BCC or in cases with recurrences. However, as cytology does not give much information about tumor patterns and subtypes, FNAC has to be followed by histopathologic confirmation. Tzanck test is also simple, easy to perform and inexpensive. Obtaining a sample is practically painless and usually does not require local anesthesia. Moreover, multiple samples can be taken from different lesions and areas where taking biopsy is difficult. It can be considered, in experienced hands, reliable for confirmation and differentiation of malignant skin tumors. The pattern is absolutely characteristic in Tzanck smear with clusters of atypical basal cells (basaloid cells), some of which exhibit retention of peripheral palisading. 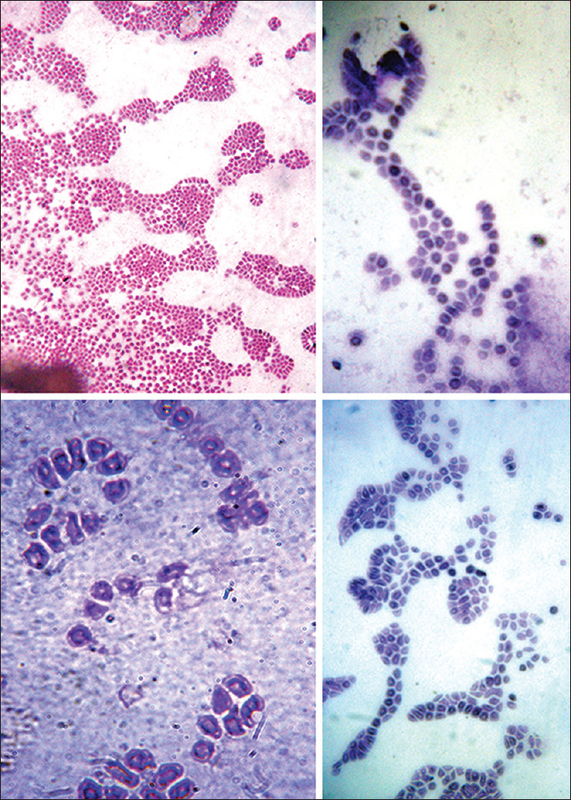 Basaloid cells are uniformly sized, a little larger than normal basal cells and elongated with a central oval, deeply basophilic nucleus which occupies four-fifths of the cells. Cytoplasm is scanty and poorly defined. The nucleus is surrounded by a thin rim of cytoplasm which is strongly basophilic and may contain melanin granules, especially in case of pigmented variety. , We made a similar observation in our study. Ruocco, compared histopathological and cytological diagnosis in 500 cases of BCC and found an accuracy of cytodiagnosis in 98.8% of positive cases and about 98.4% of negative cases. Oram et al., considered cytology reliable in the differentiation of BCC and SCC, based on their finding of excellent correlation between histopathology and cytological diagnosis. The diagnostic accuracy of cytology in skin tumors has been reported to be 98-100% in different studies. ,, High sensitivity (97%) and specificity (86%) of the cytological findings for BCC was also found in a study. But we did not find promising results in our study especially in cases with negative Tzanck test. A 100% specificity and positive predictive value in our study indicate the accuracy of diagnosis in Tzanck smear-positive cases, but low sensitivity and poor negative predictive value make Tzanck smear-negative cases inconclusive, making histopathology necessary to confirm the diagnosis. We found more of Tzanck test positivity with ulcerated lesions; this may be because of better yield of free tumor cells from the surface of the ulcer. We also found better correlation of Tzanck test with nodular subtype. The cytodiagnostic criteria suggested by Nargahi et al. for BCC can differentiate it from nevus also. Differentiating feature between BCC and SCC in tzanck smear is that squamous cell lesions show less cellular adhesion, more nuclear pleomorphism, less nuclear-cytoplasm ratio and no pink material  whereas the presence of tight groups of uniform small cells with narrow basophilic cytoplasm is considered the most consistent diagnostic feature in BCC. But diagnosing keratotic differentiation in BCC or Intermediate forms of BCC and SCC is a great challenge both by Tzanck test and histopathology. Tzanck test may be indicated for initial evaluation to meet rapid diagnostic demand as well as in suspected recurrences. However Tzanck test for diagnosis of BCC has its limitations. A negative cytodiagnosis should be judged with caution. Since Tzanck test does not give much information about tumor patterns or subtypes, it should always be followed by histopathologic confirmation before making any treatment plan. Tzanck test can be false negative in new lesions with few neoplastic elements, those with dense connective tissue stroma, or a small size or because of inadequate experience. We believe that once necessary experience and expertise is acquired, false negative diagnoses would be kept to minimum. Nonetheless, its rapidity and low cost makes this test an important diagnostic tool for BCC, especially in developing and third world countries. Spriggs AI. History of cytodiagnosis. J Clin Pathol 1977;30: 1091-102. Cordero AA. The man behind the eponym. Arnault Tzanck, his work and times. 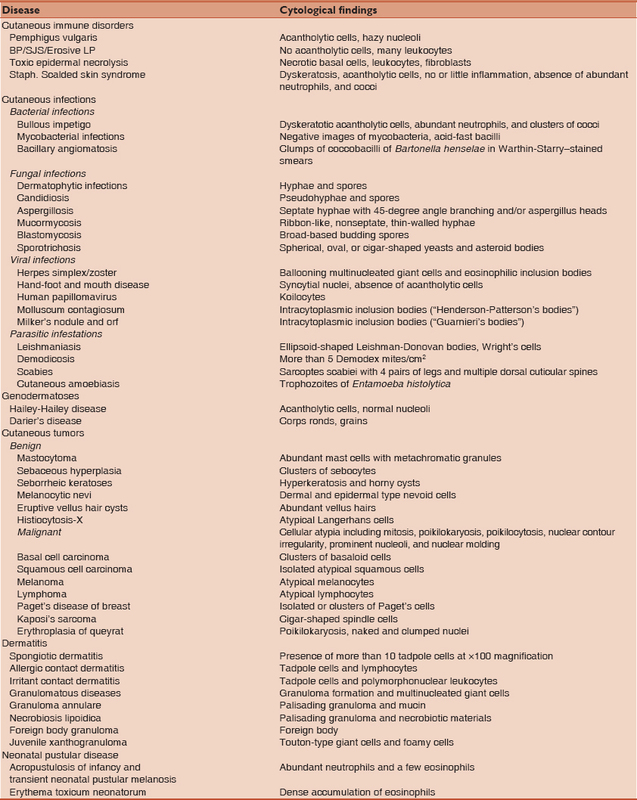 Am J Dermatopathol 1985;7:121-3. Gupta LK, Singhi MK. Tzanck smear: A useful diagnostic tool. Indian J Dermatol Venereol Leprol 2005;71:295-9. Ruocco V, Ruocco E. Tzanck smear, an old test for the new millenium: When and how? Int J Dermatol 1999;38:830-4. Durdu M, Seçkin D, Baba M. The Tzanck smear test: Rediscovery of a practical diagnostic tool. SkinMed 2011;9:23-32. Durdu M, Baba M, Seçkin D. The value of Tzanck smear test in diagnosis of erosive, vesicular, bullous, and pustular skin lesions. J Am Acad Dermatol 2008;59:958-64. Durdu M, Baba M, Seçkin D. More experiences with the Tzanck smear test: Cytologic findings in cutaneous granulomatous disorders. J Am Acad Dermatol 2009;61:441-50. Urbach F. Incidence of non melanoma skin cancer. Dermatol Clin 1991;9:751-5. Naraghi Z, Ghaninejad H, Akhyani M, Akbari D. Cytological diagnosis of cutaneous basal cell carcinoma. Acta Med Iran 2005;43:50-4. Oram Y, Turhan O, Aydin NE. Diagnostic value of cytology in basal cell and squamous cell carcinomas. Int J Dermatol 1997;36:156-7. Vega-Memije E, De Larios NM, Waxtein LM, Dominguez-Soto L. Cytodiagnosis of cutaneous basal and squamous cell carcinoma. Int J Dermatol 2000;39:116-20. Kassi M, Kasi PM, Afghan AK, Marri SM, Kassi M, Tareen I. The role of fine-needle aspiration cytology in the diagnosis of basal cell carcinoma. ISRN Dermatol 2012;2012:132196. Nigel Kirkham. Tumors and cysts of the epidermis. In: Elder DE, Elenitsas R, Johnson BL, editors. 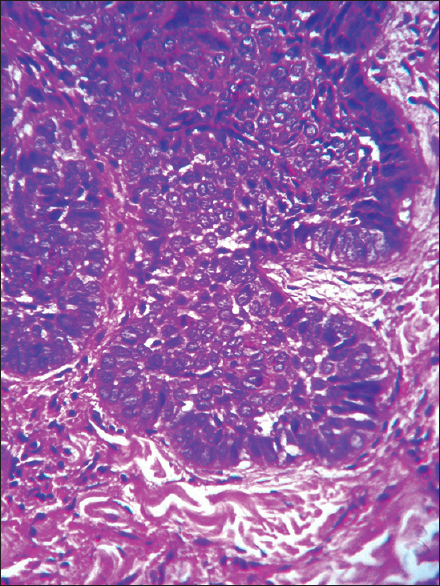 Lever′s Histopathology of the Skin. 10 th ed. New Delhi: Lippincott Williams and Wilkins; 2008. p. 826. Ruocco V. Attendibilita′della diagnosi citologica di basalioma. G Ital Dermatol Venereol 1992;127:23-9. Brown CL, Klaber MR, Robertson MG. Rapid cytological diagnosis of basal cell carcinoma of the skin. J Clin Pathol 1979;32:361-7. Von Gizycki-Nienhaus B, Kaudewitz P. Cytologic aspects of the differential diagnosis of basalioma. Hautarzt 1992;43:629-33. Derrick EK, Smith R, Melcher DH, Morrison EA, Kirkham N, Darley CR. The use of cytology in the diagnosis of basal cell carcinoma. Br J Dermatol 1994;130:561-3. Bakis S, Irwig L, Wood G, Wong D. Exfoliative cytology as a diagnostic test for basal cell carcinoma: A meta-analysis. Br J Dermatol 2004;150:829-36. Heidarpour M, Rajabi P, Sajadi F. CD 10 expression helps to differentiate basal cell carcinoma from trichoepithelioma. J Res Med Sci 2011;16:938-44.